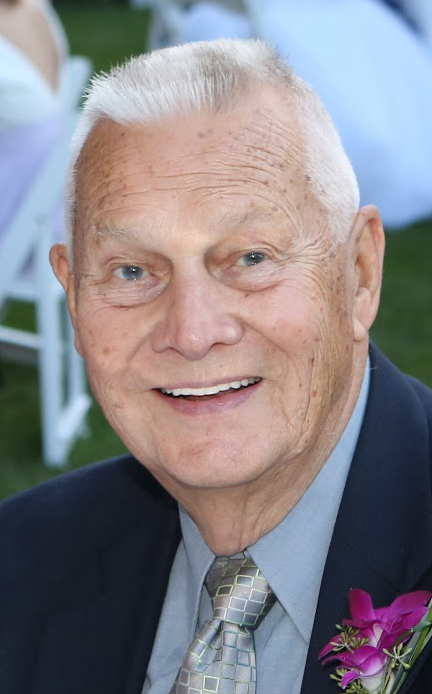 Richard Ernest Carlson, 91, of 4529 Sunset Bay Drive, Bemus Point, died Sunday, Sept. 9, 2018, in Heritage Green Rehab and Skilled Nursing. He was born March 17, 1927, in Stillwater, a son of the late Ernest W Carlson and Florence M Anderson Carlson. While attending the University of Rochester he was also enrolled in officer’s training for the U.S. Navy. Upon graduation he received a Bachelor of Science degree in mechanical engineering and achieved the rank of ensign in the U.S. Navy. Prior to his retirement in 1992, he was vice president of manufacturing at Blackstone Corporation. He holds several patents for machines which are still in use in the production of heater and radiator cores used in automobile manufacturing. He was a committed Christian and a lifelong member of Stillwater United Methodist Church, where he served as choir director, trustee, Sunday school teacher and building committee member. He loved living on Chautauqua Lake, boating, sailing and water skiing. Above all else he loved spending time with his family. His family will remember his intelligence, generosity, loyalty, can-do attitude and occasionally mischievous sense of humor. He is survived by his second wife, Shirley Carlson; his daughter, Candace Laurel Carlson of Brecksville, Ohio; three grandchildren: Erica Rae Larson (Malachi Witt) of Avon Lake, Ohio, Jenna Marie Larson of Gahanna, Ohio and Reid Daniel Larson of Brecksville, Ohio; and four stepchildren: Bruce (Andrew) Carlson of New York City, Laurel (Joseph) Siperek of Jamestown, Bradley (Shawna) Carlson of South Carolina and Barry Carlson of Sandusky, Ohio. Besides his parents, he was preceded in death by his first wife, Margaret Carol Frangione Carlson, who died Oct. 30, 1993; and his brother, Allan R. Carlson, who died Aug. 3, 2018 in Rockford, Mich.
Friends and family will be received from 4-7 p.m., Friday, Sept. 14, 2018, in the Lind Funeral Home. The funeral will be held at 10 a.m. Saturday, Sept. 15, 2018, in Koinonia Christian Fellowship (the former Stillwater United Methodist Church), 1428 Warren Jamestown Blvd., Jamestown, NY 14701. Pastor Ronald A. Lemon will officiate. A brief burial ceremony attended by close family members will be held in Bemus Point Cemetery immediately following the church service. Memorials may be made to St. Jude Children’s Research Hospital, 262 Danny Thomas Place Memphis, TN 38105. or Shriners Hospital for Children, 1645 West 8th St. Erie, PA 16505.